Mac & Cheese, PB & J, and bacon and eggs are matches made in heaven. As you get older, you especially appreciate other things that are aged, including my favorite pair of all time, wine and cheese. One of the best, and easiest, ways to have guests over is to serve them a heavy wine and cheese course, but with a plethora of cheeses and wines on the market, how does one narrow anything down? 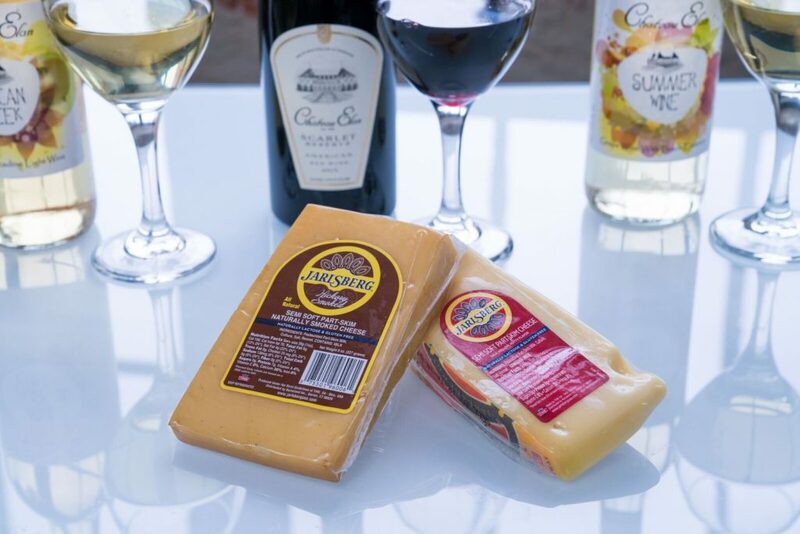 I am sharing 6 Tips That Will Help You Pair Your Wine and Cheese Perfectly. Select wines and cheeses that are complementary to each other. 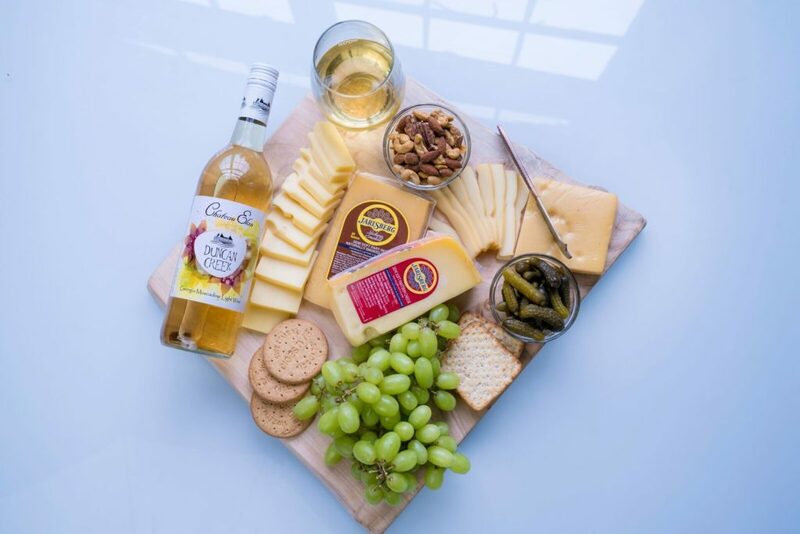 I adore Jarlsberg cheeses, and their Original Wedge pairs perfectly with a bottle of Chateau Elan’s Duncan Creek that Erica recently gifted me with. On their own, the cheese would be a little too funky for me and the wine would be a touch too sweet, but together, the wine brings out the cheese’s sweetness and the cheese brings out the tartness of the muscadine grapes. 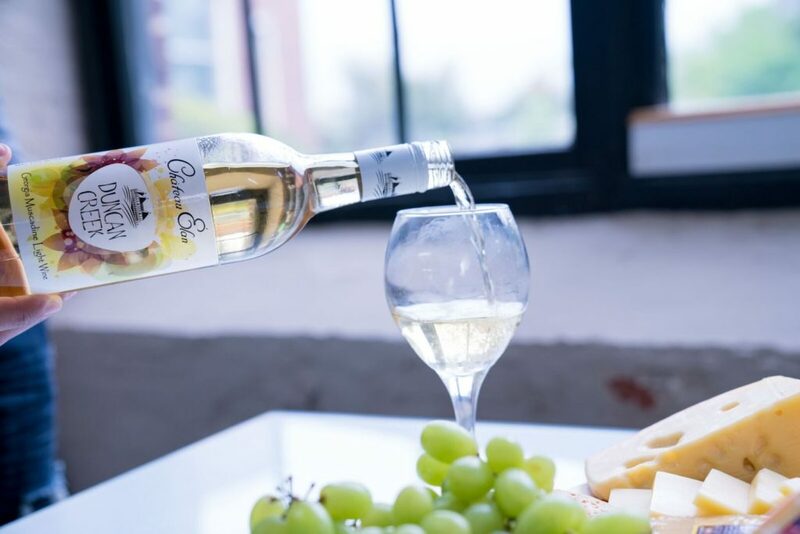 Chateau Elan’s Summer Wine ended up being a perfect match for the Jarlsberg Smoked and I was hit with these awesome earthy notes in the wine that weren’t present when I sipped it on its own. 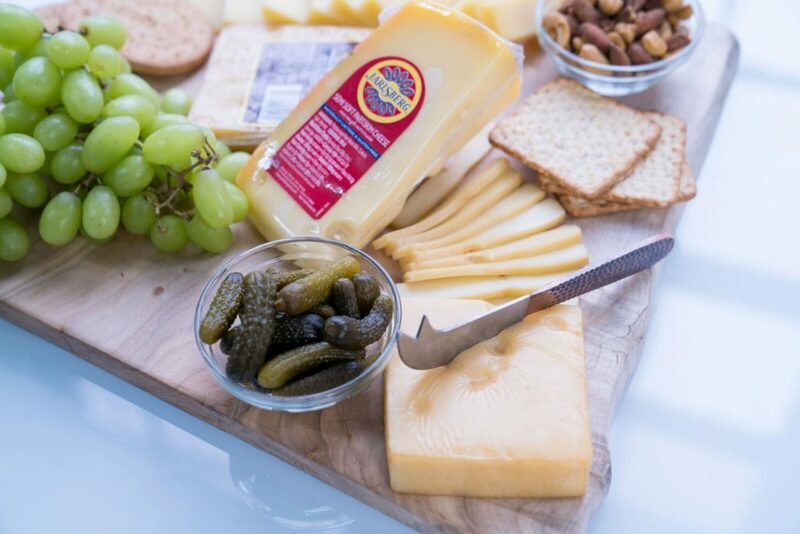 I’ve never once been disappointed by a Jarlsberg Cheese and the company promotes a lifestyle of giving and sharing; hence they produce a cheese you’re proud to serve to friends. As I’ve gotten older, I’ve tried to be more aware of where my food comes from and I love that Jarlsberg uses milk from a co-op of over 15,000 Norwegian farmers. 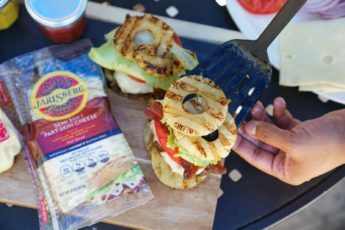 The quality dairy is part of a secret recipe over 60 years old, and while cheese-making technology continues to evolve, I like that Jarlsberg believes in delivering the same quality product that they did as a small company in 1958. I love that Chateau Elan is a Georgia winery and that purchasing it for my evenings entertaining at home allows me to support local economy. 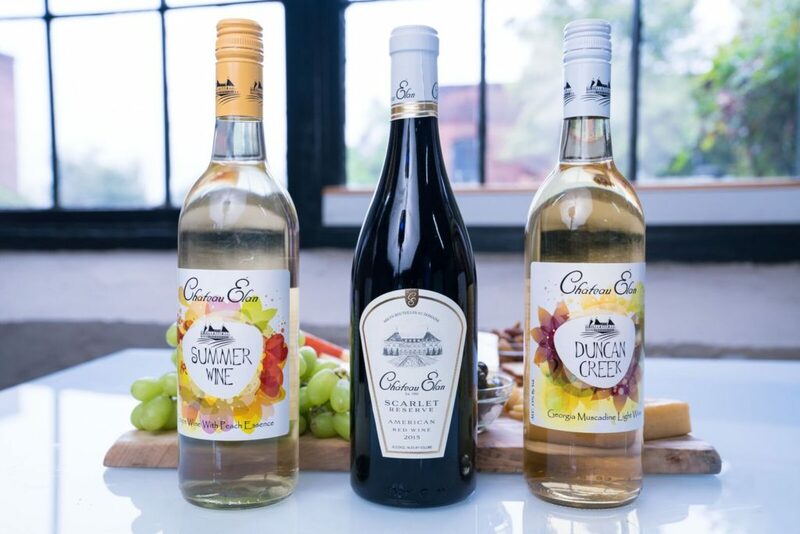 It’s amazing to me that an international-award winning winery is less than 50 miles away from my front door, and they use up-and-coming superfood muscadine grapes in their blends. If my guests and I consume a couple of glasses (or more), we can feel good about drinking a wine that uses grapes that contain more healthy compounds than goji berries! Let’s go Extreme 101 with this lesson and pretend you have zero experience with a gourmet cheese counter. 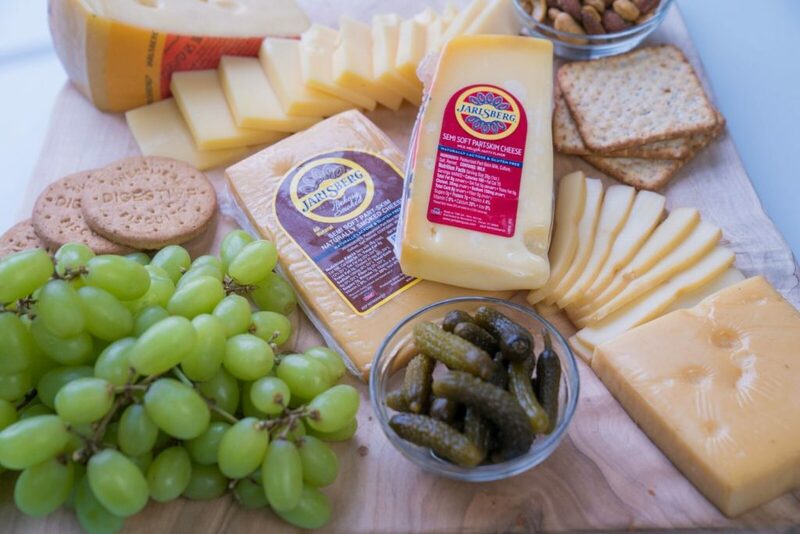 You don’t need to be a gourmand to create a cheese platter; just think about flavors you already love. 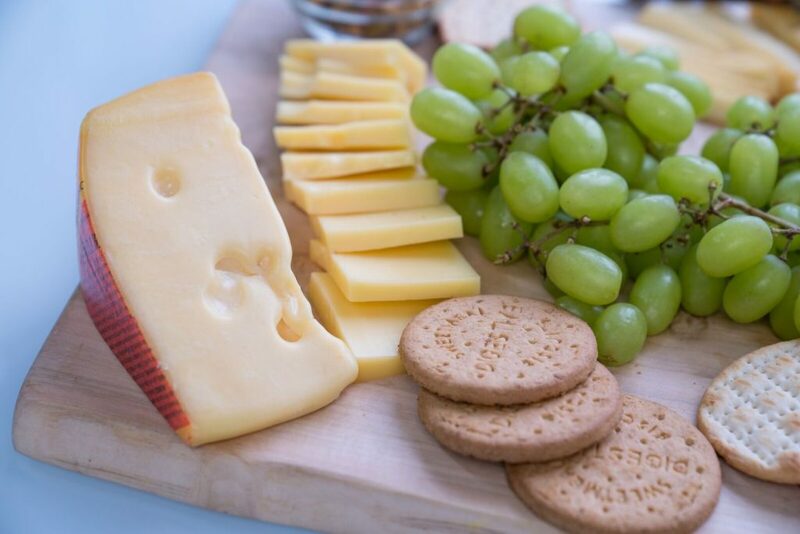 If you love the cheddar/American-adjacent flavor of singles-wrapped cheese, consider putting a hard English or Irish cheddar on your cheese board. If you love the neutral flavors of mozzarella on your pizza, a fresh buffalo mozzarella or a soft burrata may be right up your alley. If you love blue cheese dip with your buffalo wings, a Maytag, Roquefort, or Stilton may fit your semi-hard needs. At the end of the day, it’s wine and it’s cheese. It’s difficult to serve ruinous pairings; you just want to serve the best possible ones. Start with a goal to serve at least one hard, one semi-soft, and one soft cheese on your platter with some fruit/smoked salts/jams; alternatively, serve only cheeses from the UK or from France (#themes for the win). 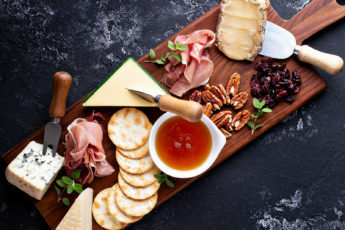 Websites like Chateau Elan and Jarlsberg offer a number of helpful hints, so use them as needed to create your best possible platters, and build your own hosting self-esteem. We eat with our eyes first, so you want to create pretty plates. A wooden board makes your cheeses look restaurant-quality. 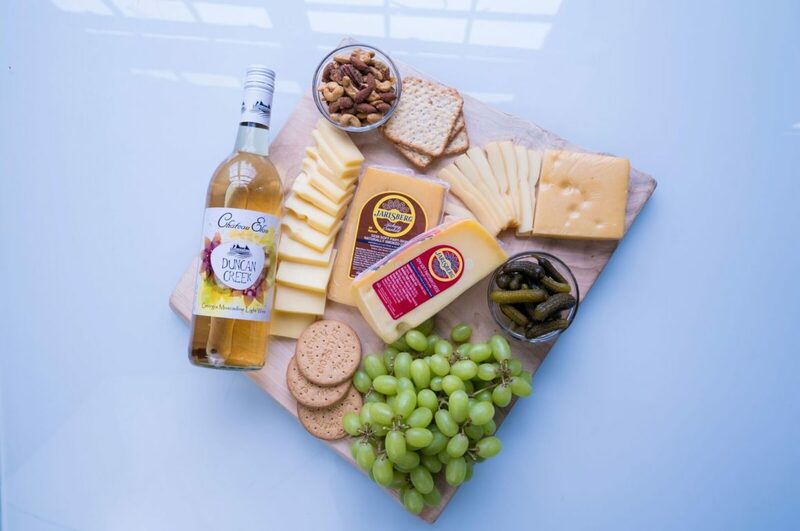 As engagement and wedding gifts roll in, Erica recently got a beautiful board from Wood Kith I have total envy over, and this fallen-tree sourced platter is perfect for making your Jarlsberg offerings look totally professional. 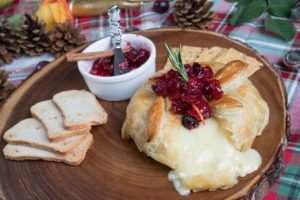 Sweet and savory jams, nuts, and fresh and dried fruits are must-haves because they’ll bring out different notes of the wine and cheese, so intermingle them between your cheese wedges for visual interest. In this case, crackers serve as edible plates and you don’t something that will compete with the cheese and the accompaniments. I personally like water crackers as they’re thin, crispy, and neutral in flavor. Chateau Elan offers plenty of wine-tasting classes. 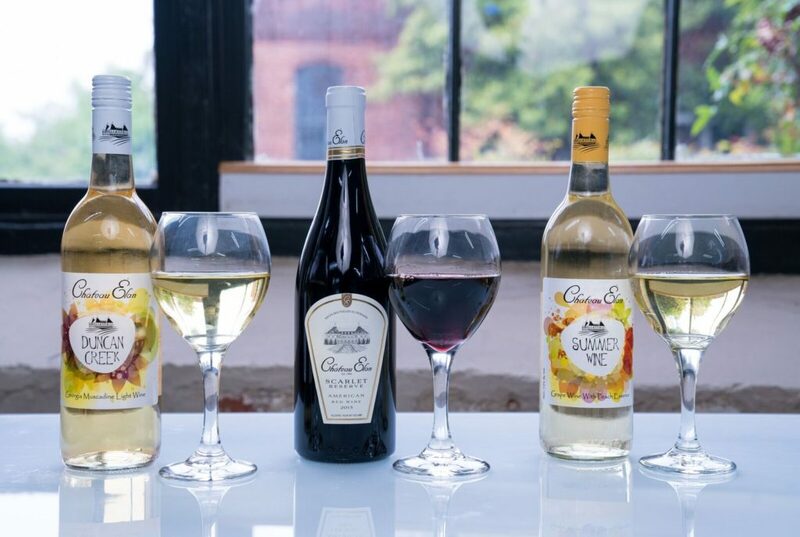 With take-home bottles starting at $15, Eating with Erica-favorite Chateau Elan will let you come taste some of their seasonal wines, and you can get an inclusive lesson on wines and some potential pairings. Bonus: Some of their wine names come with hints of fruit to pair your cheese platter with! 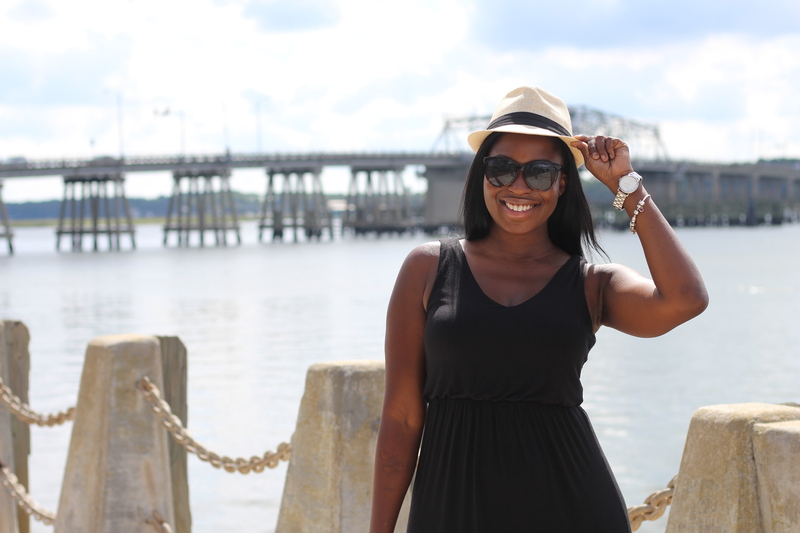 With Mother’s Day and wedding season fast approaching, I’m so relieved Chateau Elan offers classes and tours of their amazing winery (gift-shopping done!). 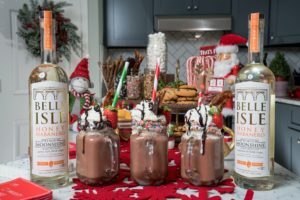 They have daily tours of the winery, and have an incredibly cool monthly Taste of Georgia class that highlights their wines with Georgia cuisines in ever-changing themes. Additionally, with this time of year, it seems like everyone is having a party and wants you to bring something. 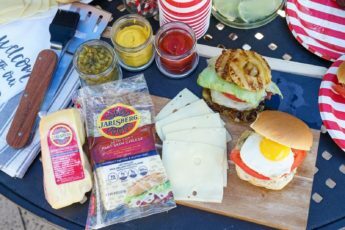 Get out of your premade veggie platter, and use Jarlsberg’s awesome website for suggestions on how to build easy cheese boards, and recipes for everyday eating. They’ve got one for a fig-and-arugula pizza that is calling my name. I know that when I’m making that with my Jarlsberg Original, and serving with a glass of the Duncan Creek, I’m dining with two companies that believe in high quality and unique taste. 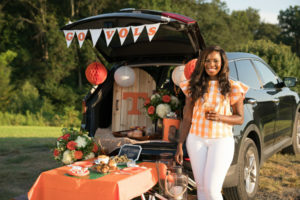 Rachel Boyd is an Atlanta native, holds degrees from the University of Georgia and Kennesaw State University, and is a reformed picky eater (still trying to overcome an irrational shrimp-phobia). 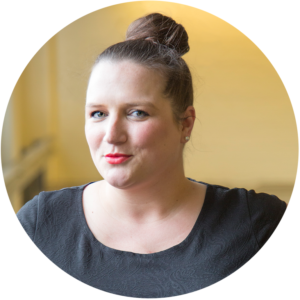 Non-cooking-related passions include her Great Dane-Bulldog mix, volunteer work, and half marathons with the Atlanta Track Club, bourbon, binge-watching detective shows, reading all the books, learning French, cute bearded dudes, and spending time on her best friend’s farm.